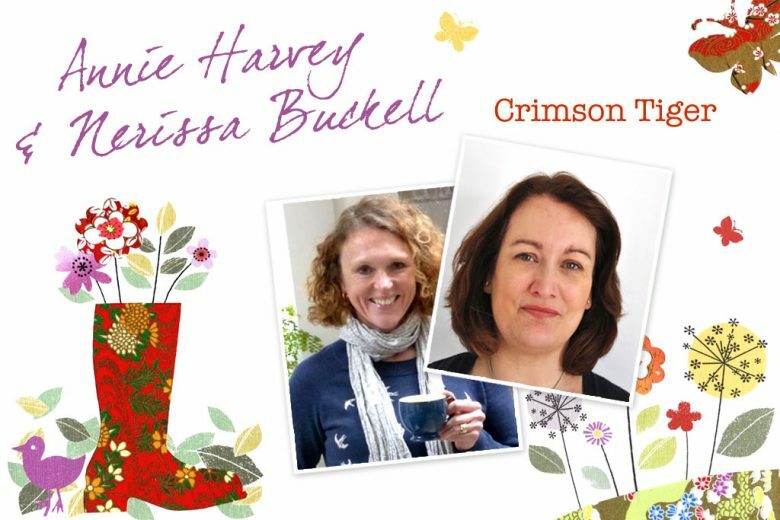 Friends and fellow mums Annie Harvey and Nerissa Buckell started online homeware, gifts and accessories website Crimson Tiger in 2013. Read what inspired them to start the business, why they’re so passionate about it, and how it’s been a steep learning curve for them both! Annie: I did a German degree, then went travelling. I ended up (after lots of trying) as a broadcast researcher for various TV channels. My last job was Research Manager for GMTV, and then the kids came along! It was a great industry to be in. Nerissa: Hmmm…. career! I was a secretary for most of my working life but would regularly leave my job to go on extended holidays abroad as I loved travelling. Often the travels were centred on horse racing which is a family passion. I spent 12 years as a stay at home mum looking after my four boys as my husband’s career would take him abroad regularly. When my youngest went to primary school I started up a small business selling jewellery, which I have recently sold to two mums. What inspired you to start Crimson Tiger? Annie: I wanted something that would fit around the kids, could be mainly done from home and was something I was interested in (and making some money would help too!). Nerissa already had a jewellery business, and walking past a knitting shop near me I saw wonderful hand made scarves and I thought, ‘Wouldn’t it be great to set up a website selling scarves, jewellery etc?’ Not being able to knit properly put paid to that though! Nerissa: About a year after I had started the jewellery business, Annie approached me and asked if I would join forces with her and start an online gift company. It’s so difficult to be an employee with set hours and be a mum, as most mothers will tell you. If you do not have family to be able to help with the childcare or a very high salary, nearly everything you earn goes on childcare, so working for ourselves is one of the few options available. What was your vision for the business, and has it changed? Annie: For me, the vision hasn’t changed. We wanted to create a successful online business that was a) profitable and b) a strong brand. Nerissa: The main vision has remained the same but the company has started to develop its own personality. Annie and I have very different styles, and Crimson Tiger is developing its own distinctive style, a combination of the two. Annie: Fun! It’s really good having someone else to bounce ideas off and check things against – we may not always agree on everything, but it would be harder going solo. We send inordinate amounts of emails and texts, and have, at times, got to the telepathic stage with each other! Nerissa: Before Crimson Tiger we both were on a committee that ran our local preschool, so we both had a good idea of how the other worked. We have both slotted into our roles and luckily my weaknesses are Annie’s strengths – for example my spelling is atrocious. What have you found most difficult about starting the business? Annie: Getting your name out there when you haven’t got a large marketing budget is the biggest challenge. I guess we just have to be patient and committed. Social media and all that surrounds it is a whole new ball game too. Nerissa: Marketing. Getting your name out there and trusted is the hardest thing. What would you do differently if you were able to start again? Annie: Nothing I don’t think. Ask me again in five years! Nerissa: I would have gone on a web design course before starting. Originally we were going to get someone to do it for us, but the costs kept adding up so I boldly declared over a coffee one morning I shall try to do it! What have you found surprisingly easy or enjoyable? Annie: I have really enjoyed going to trade fairs and seeing just how creative people are out there! I love seeing what other people can produce and how artistic they are. (Cue: jealous face). I do also like thinking up ideas for how the website could look and writing blogs – being a bit more creative than analysing numbers, which I am more used to! Nerissa: I am secretly proud that I did get the website up and running. I am proud of us for pulling it all together and learning so much in the first year, more than I would have thought possible. Realising that I can still develop skills after being so long out of the workforce is a buzz. How do you source your products and what’s your criteria? Annie: We go to trade fairs and look for things that either we like or that we feel are ‘Crimson Tiger-ish’. Our Tiger has taken on a personality of its own which I think we both understand! Nerissa: We find a large majority of our products at trade shows, but also through chance meetings. Our new range of cards came about at a school fair. I was there with the jewellery business and the table next to me was Small Red Bird. After swapping contact details I realised that Sally was married to my childhood neighbour’s son. Regarding criteria, we find that if Annie and I both love something then it usually sells well. Annie: Our target market is ABC1 women aged 30+ who need a gift or something for herself or the home. She doesn’t want to spend a fortune, but also doesn’t want run of the mill goods. Nerissa: Usually it is someone who wants to buy something slightly different to the usual high street finds, or someone who is short on time and wants us to send the gift and card for them. How do you fit your business around your family? Annie: It’s amazing what you can fit in between 9.30 and 2.30! I always keep a notebook in the car for when inspiration strikes and I’m waiting to pick the children up. We make sure we’re not on holiday at the same time but not having a physical shop to open up means we can be much more flexible. Nerissa: I try to work while the kids are all at school, and our weekly meetings take place then. In between the meetings, we communicate with numerous texts and emails. I regularly take my laptop when the boys have their swimming lessons and work, also in the car in between school runs. I work in the evenings when they have gone to bed too, often my husband will be sitting opposite me at the table with our laptops both working. It sounds like there is no work life separation but at least it means that I can be with the boys when they are at home, when they are ill or during school holidays, they are only young for such a short time. When they leave home (I say hopefully) then a more defined work-home balance can be reached. What’s your vision for five years time? Annie: To have really grown the business and be on the road to becoming a household name! Nerissa: I would like to expand our individual artists and crafters. There are some amazingly talented people out there who would rather concentrate on making their products and don’t want to pay a fee to sell their goods. I also yearn for a desk! Annie: Go for it! Start small and aim for steady growth. Ask advice and favours from everyone who may be able to help. It’s amazing how your own friends and family can provide inspiration or practical help. We were very lucky having lawyers, market researchers and server providers at our fingertips who have helped make things a lot easier. Nerissa: Have self-belief and courage, and just give it a go. You don’t have to start big – so many of the companies that are now household names were one person with an idea. If you’ve worked with someone and know that your working styles go well together, go into business together. Having a business partner helps with the pressure, work load and makes it far more enjoyable, plus they can often have far better ideas than you! You can find out more about Annie and Nerissa and browse their products on the Crimson Tiger website.